When I see a huge mark down on bell peppers I tend to buy a lot of them. Yesterday I noticed them on sale at a local market and I bought all of the red bell peppers. I ended up coming home with 20 peppers! I enjoy eating fresh or raw hot chili peppers but not bell peppers. 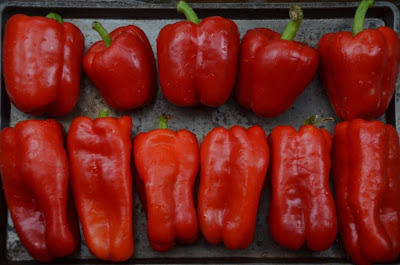 However, I love to cook with roasted bell peppers. I find that they have more intense flavor and aroma when roasted. You can use a grill or the kitchen oven. I had many bell peppers and it was raining and cool outside so I used my oven. I lined them on 2 medal trays and roasted them at 350 degrees F for one and a half hours. I turned them every half hour and moved my trays to a different roasting rack in the oven for even roasting. Once they have been roasted I removed all of the peppers and put them in a paper grocery bag, folded the top to seal the bag and kept them in the kitchen sink. After about 40 minutes I took them out and removed the skin and seeds. The skin comes off easily once the peppers have been steaming in the paper bag. What I didn't plan to use this week I partitioned in zip lock bags and saved them in the freezer for future use. If you have a food saver sealer then you can use that to keep them even longer in the freezer. Most likely my batch will be used up by the end of summer! 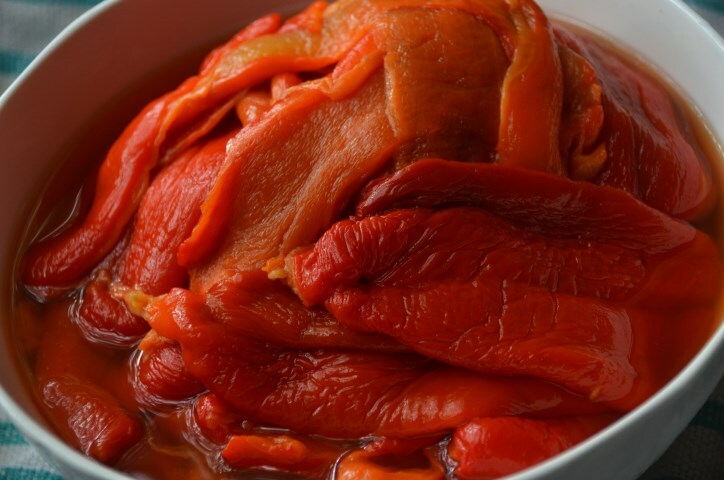 There are many ways to use the roasted bell peppers. I like them in stir fry, pasta, pizza, lasagna, salads, appetizers, filling mixture for ravioli, and a multitude of other delicious preparations. 1) Wash all of the bell peppers and line them in a medal tray. 2) Roast at 350 degrees F for 1 1/2 hour, turn the peppers every 1/2 hour. May move and switch the trays in the oven for more even roasting. 3) Once done remove the peppers and place them in a paper bag. After 40 minutes or when the peppers are cooled down enough to be handled, remove the skin and seeds. *If you are grilling fewer peppers and are just using one tray then the grilling time may be 30 minutes shorter. Unfortunately I have only one oven in my small kitchen and I had to use 2 racks in the oven for all of my peppers. Using 2 racks increased my roasting time.